In the warehouse or factory, every square foot of space matters. Narrow aisle (NA) and Very Narrow Aisle (VNA) reach trucks are designed to maximize floor space without sacrificing productivity. Designed to “reach out” to goods stacked high on pallet racks and navigate narrower aisles than standard forklifts, one of the most distinguishing feature of a reach truck is that instead of having a bulky counterbalance at the back of the truck, it has outriggers at the front to prevent the forklift from tipping under load. Because of the special requirements it must fulfill, finding a suitable used reach truck can be more difficult than finding a more common all-purpose wide aisle forklift. Turret trucks, which swing the forklift carriage and mast from side to side. Articulated trucks, which swing the mast and forks, while the carriage remains stationary. Order pickers have platforms on which workers can stand and “pick orders” from shelves when full pallet loads are not needed. Straddle reach trucks have forks that can be adjusted from the carriage to “straddle” a load. Double reach (or double deep) trucks have telescoping forks designed for carrying two pallets at the same time. Other NA reach trucks include side loaders and low lift pallet and platform models. In many instances, buying a used reach truck can be a better decision than buying a standard wide aisle (WA) forklift. 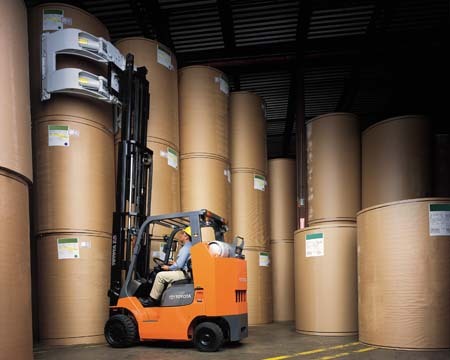 Sometimes nicknamed “flexies” because of their flexibility or versatility, a standard electric reach truck can perform most or all of the tasks a WA can perform. The same can’t be said for a WA forklift, though. Because of its size, a WA forklift lacks the nimble maneuverability of a reach truck and also usually lacks mast and/or fork features found on NA forklifts. When choosing a used reach truck, keep both your current and future needs in mind. For example, if you have limited workspace, you may need to add more vertical storage space at a later date. If you anticipate this, consider buying a double masted model for greater vertical reach. Also think ahead about your average and greatest load limits. It’s usually better to buy a forklift with greater load limits than average, to allow for those occasions when heavier loads need to be moved. Our customer representatives and service personnel will be happy to help you choose the right used reach truck for your needs. As members of the Bahrns Materials Handling Equipment & Supplies team, we have over 40 years of experience in materials handling behind us. Whether you’re a small business that needs a compact used reach truck for your loading dock storage area or a large warehouse in need of a fleet of vehicles, we have the expertise you need for all your material handling needs. Contact us with any questions you may have about used reach trucks or any other products you find here or in the Bahrns catalog of industrial equipment and supplies.